Introduction/Background: In 2005, the ACC/AHA ST-elevation myocardial infarction (STEMI) guidelines considered new-onset left bundle branch block (LBBB) in the setting of suspected acute coronary syndrome (ACS) as a STEMI equivalent and an indication for reperfusion therapy with fibrinolysis or percutaneous coronary. We present the case of a 64-year old female who underwent left total knee arthroplasty under general endotracheal anesthesia with femoral catheter placement and interspace between the popliteal artery and capsule of the posterior knee single shot block. Her past medical history was significant for hereditary hemochromatosis, cirrhosis with grade 1 esophageal varices and portal hypertensive gastropathy, type 2 diabetes mellitus with insulin-dependency, hypertension, nephrolithiasis, breast cancer, anxiety, depression, and acute kidney injury after a previous operation. The regional anesthesia procedures were performed without untoward sequence. Intraoperatively, the patient was noted to have intermittent tachycardia with widened QRS complexes though she remained hemodynamically stable and the operation proceeded uneventfully. While in the post-anesthesia care unit, the patient again developed a sinus tachycardia which was evaluated with a 12-lead electrocardiogram (ECG) with widened QRS complexes and the appearance of a LBBB (Figure 1). However, the patient remained asymptomatic and denied any problems with chest pain, dyspnea, anxiety, surgical pain, nausea, or vomiting. Notably, the patient had undergone a cardiac ischemia evaluation in the preceding 3 months for chest pain and palpitations which demonstrated a small, low-risk reversible defect of the inferior left ventricular wall on myocardial perfusion scan and transthoracic echocardiogram. As the patient did not have a history of LBBB on previous ECG, Cardiology was consulted for new-onset LBBB with concern for potential ACS. After their evaluation, the patient was determined to have a new-onset LBBB without symptomology or clinical or laboratory evidence of ACS. The patient was admitted to the telemetry floor post-operatively without any further issues, and she was subsequently discharged home. Discussion/Conclusion: The appearance of LBBB on ECG may mask the characteristic ST-segment changes of an acute myocardial infarction, complicating the diagnosis. 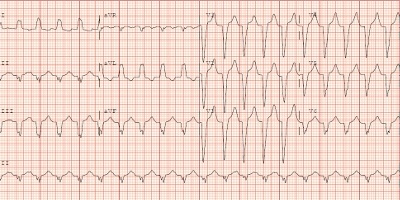 While the Sgarbossa criteria were developed to help improve the predictability of ECG changes in acute LBBB and ACS, follow-up studies have yielded mixed results about its utility. The 2013 ACC/AHA guidelines recognize that new-onset LBBB is not a STEMI-equivalent. Recent evidence demonstrated that new-onset LBBB resulting from STEMI is not as common as previously thought and moreover represents pre-existing structural heart and coronary artery disease. In the patient undergoing general anesthesia, recognition and diagnosis of ACS can be challenging. As chest pain may either be unreportable or masked in the surgical patient, there is an increased reliance on electrocardiographic, laboratory, and imaging studies. The historical perspective that a new-onset LBBB necessitates emergent intervention is no longer valid. Rather, new-onset LBBB should be taken as a marker for underlying heart disease and its presence should be evaluated further for potential ACS.